Academic Impressions (AI) is an organization that seeks to serve higher education professionals via educational products and services that help institutions tackle their challenges. AI offers webcasts, conferences, on-campus workshops, and news publications. 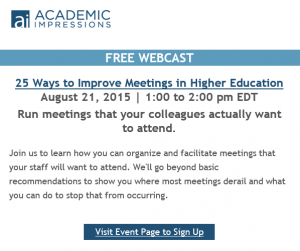 SMU HR will be hosting this webinar on improved meetings in higher education settings in the HR Training Room. Get away from office distractions, watch with your peers, and have a brief discussion afterwards. Encourage your team members to attend as well! 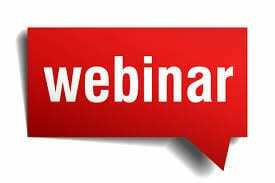 August 21, 2015 from 12:00 – 1:00 p.m.
Access to the live webcast. You may invite others to attend with you. BYOL! We’ll open the training room kitchen for beverages – feel free to bring food so you can lunch while you learn! If you can’t get away or wish to watch from your office, please follow these directions to enroll yourself on the vendor’s website. Click on the image below to learn more and be redirected to the registration page. If you attend the session email DevelopU@smu.edu and we’ll add your attendance to the course session so that your training summary will reflect your attendance. Dr. Greg Eells is the Associate Director of Gannett Health Services, and Director of Counseling and Psychological Services (CAPS) at Cornell University. The following is a summary of his TEDxCortland talk. If his TED talk, he states that we all strive toward a life full of meaning but when we face the inevitable obstacle, it’s how we bounce back that matters. This “bounce” is also defined as resilience. Or another way of defining resilience is how and what we make of the broken pieces of change. The ability to shift our mindsets is unique to human beings. Dr. Eells developed a model to help us remember how to manage our mindset and practice resilience. : Resilience SAVES. Do something for somebody else. The act releases oxytocin and dopamine, or the feel good chemicals in the brain. Pervasiveness – when we are resilient we can contain negative events and shift our focus to the positive. Letting the positive grow overshadows the negative. Personalization – remember that it is not about you. Open up to the broader context and history and recognize it’s greater than you. Get you Ps straight in order to build a more resilient self and culture. V alues: Find something to hold on to during the tough times. Understand your purpose in life by balancing the sense of your uniqueness with humility and then pursue what really matters to help you find your meaning and your purpose. E motions: We don’t have good language to express our emotions. When we face tough situations, we struggle to explain what we are feeling. Embrace a creative hopelessness, let go by accepting what is, and remain curious by asking good questions in order to understand what is happening around us. S illiness: Step back and laugh at yourself. When we take ourselves too seriously, we miss the big picture and the obvious. Happiness, success, health – we all strive toward a life full of meaning. When we do face obstacles, the Resilience SAVES model can determine how we move forward.